The death of Archibald Richard of New Mills occurred Monday, November 26th, 2018 at the Campbellton Regional Hospital at the age of 77. Born in New Mills, he was the son of the late Peter and Margaret (Mazerolle) Richard. Archie is survived by his wife Mary Ann; sons Ricky (Susan Furlotte) and Brian (Kelly Lapointe); daughter Lisa; grandchildren Shyla, Holley, Marcel, Thomas and Dorothy; great-grandchild Hudson; sisters Lidia (Edgar Carrier, deceased), Rita (Peter Roy, deceased), Elizabeth (Cecil Harding), Theresa (Henry Biseau, deceased) and Alice (Norman Bertin); as well as his brothers Edmond (Stella Chamberlain), George (Evaline McNeil), Leander (Mona Lapointe, deceased), and Edward (Betty Ann Smith). He is predeceased by his sister Ruby (Madore Theriault) and brothers Joseph and Leonard (Grace Dickie, deceased). 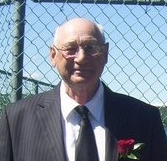 A graveside service will be held for Mr. Richard in the summer of 2019. More details to be announced at a later date. Funeral arrangements are in the care of MacMillan’s Funeral Home, Black Point.